ESA astronaut Andreas Mogensen’s time on the International Space Station has come to an end. The Soyuz TMA-16M is packed with the equipment Gennady Padalka, Aidyn Aimbetov and Andreas will take with them. 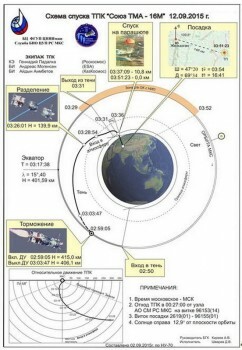 At 18:13 they will close the hatch between the spacecraft and start preparations for their return flight. Watch this video that explains the Soyuz undocking and landing. First the astronaut will remove the clamps inside the docking assembly and close the hatch between the International Space Station and Soyuz. They will perform a leak check of the docking interface by reducing the pressure in the vestibule between the two hatches. The astronauts will “salt-loading” to fill their bodies with water to counteract the fact that in space your body holds less water. If they did not fill up with water they risk arriving on Earth seriously dehydrated. Gennady, Andreas and Aidyn will put on medical telemetry belts and tight-fitting shorts called the Kentavr to stop blood from the legs flowing to the head during reentry. Afterwards they will put on their Sokol pressure suits in the orbital module. The orbital module will burn up in the atmosphere in just a few hours so the next step is to close the hatch inside the Soyuz spacecraft between the descent and orbital module. They will test their Sokol suits for leaks and once complete decrease the pressure by 150 mm mg in the orbital module to verify that the hatch between the two modules is airtight. 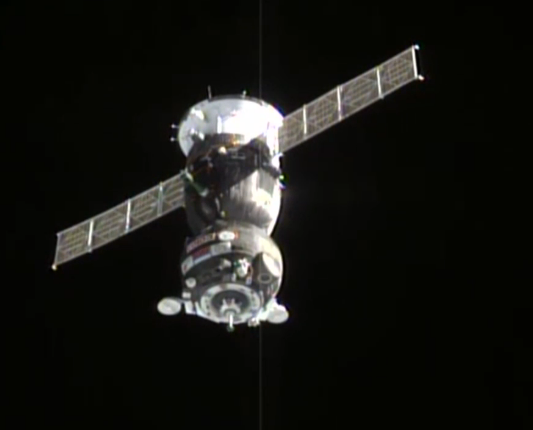 The undocking will release springs that push the two spacecraft away from each other, at 20 meters distance the Soyuz will fire its engines to increase the departure velocity. 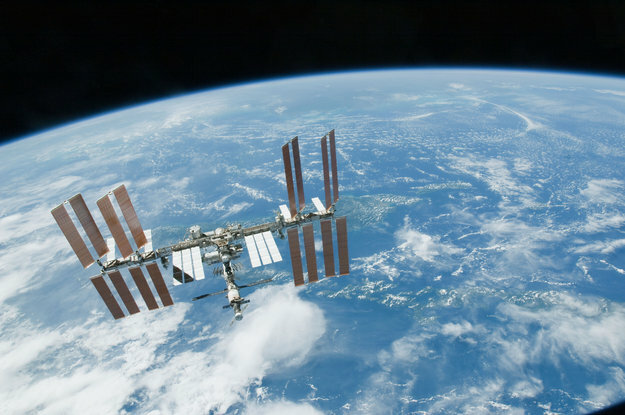 They will spend about two hours orbiting Earth before braking to reenter our planet’s atmosphere at around midnight. 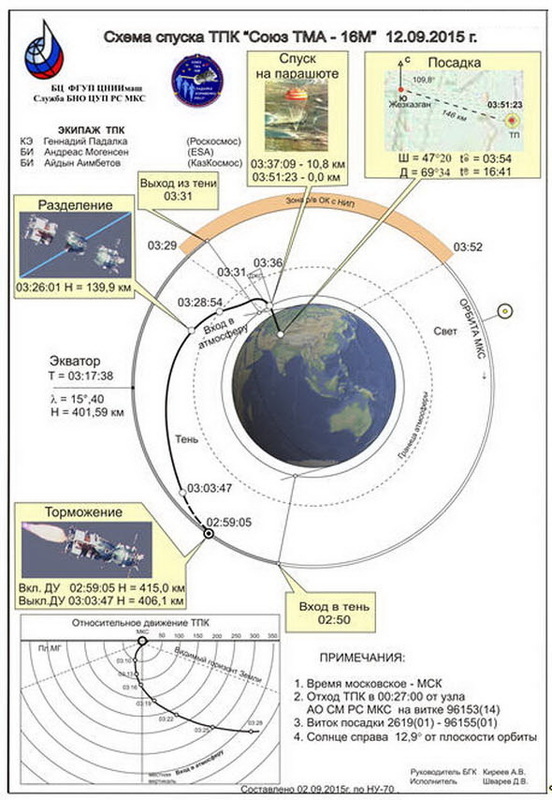 From here it will go quickly, three modules of the spacecraft will separate with two burning up in the atmosphere. The descent module will encounter temperatures of up to 1600°C as friction from the atmosphere heats the protective shield and blocks all radio communication. At 10 km above sea level a parachute is deployed automatically, slowing the astronauts down from 864 km/h to 324 km/h. The base heatshield is then jettisoned to expose the four solid-propellant motors. Retro-rockets fire moments before impact to bring the touchdown forces to a minimum – still likened to the force of a small car crash. The Soyuz seats are custom-fit and include springs to soften impact even more. During the iriss mission the seats from the Soyuz TMA-18M were put into Soyuz TMA-16M for Andreas and Aidyn. Search and rescue teams will be on hand as soon as possible. Do not rise from your seat or leave the Descent Module too soon. Stay in your seat for several minutes and only then rise from the seat! Limit head and eye movement. Take it easy. We look forward to seeing you on the ground. Have a safe landing and return to Earth!